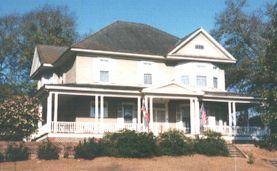 Citizens of the quaint Town of Pine Apple, located in eastern Wilcox County, hold several annual events each year that draw hundreds of visitors to the area. The Front Porch Tour, held in May, is a smaller version of a Tour of Homes and features many of the homes and historic structures of this unique town. The town's citizens invite all to stop by and "sit a spell" on their front porches, a custom of times past. Hunter Appreciation Day is held each November. Hunter Appreciation Day is a weekend celebration of our hunting heritage and a time to thank the many hunters who travel from near and far to enjoy Wilcox County's great outdoors experience. Complete with great food, arts and crafts, live music, and a big buck contest, this event has something to offer to everyone. See more about these events at the Pine Apple Promotions website.